Courtesy: William Gladstone, Author, "Men of Color"
Company C. Thirty-eighth U. S. Colored Troops, among the very first to enter the rebel works, although himself previously wounded, has a medal for his gallantry. Company I. Thirty-sixth, U. S. Colored Troops, rushed in advance of his brigade, shot at a rebel officer, who was on the parapet cheering his men, and then ran him through with his bayonet. He will have a sergeant's warrant and a medal for gallant daring. 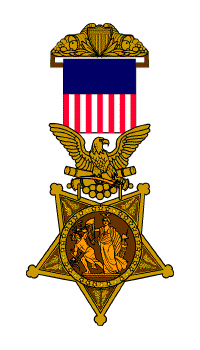 Company B, Thirty-eighth U. S. Colored Troops, has a medal for gallant conduct in the assault of the 29th instant. Thirty-sixth U. S. Colored Troops, after having his arm so badly mutilated that immediate amputation was necessary, loaded and discharged his piece with one hand, and urged his men forward; this within thirty yards of the enemy's works. He has a medal and a sergeant's warrant. Company C, Thirty-eighth U. S. Colored Troops, thrown into command of this company by the death of the officer commanding, was the first enlisted man in the enemy's works, leading his company with great gallantry for which he has a medal.